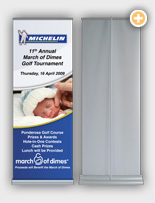 This smart retractable banner comes complete with the perfect combination of design appeal, durability, and value. These banners are quick and simple to use and hold 7' banners (84"). The base is finished in anodized silver or matte black with heavy-duty molded end plates, and is easily portable in it's foam-padded carrying bag. Price includes banner printing, banner stand, and carrying case.